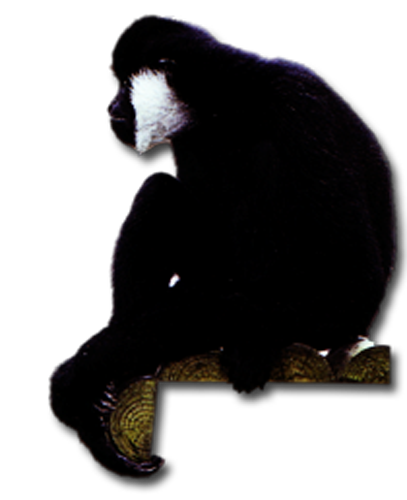 Hylobates are comprised of the gibbons and siamang. They are small (10 – 30 pounds) arboreal apes native to the subtropical and tropical Asian rainforests stretching from China to Indonesia. According to Stanford, et al., “These apes form monogamous pair bonds and like most monogamous species, they show very little sexual dimorphic expression with relation to body size. Their territories are defended through various species – specific vocal arrangements as they are the most vocal non human primates.” The disparity in species – specific duetting suggests that the functionality of duetting varies across the genus (Geissman and Orgeldinger). Hylobates, on average, have a lifespan of approximately 25 years in the wild and 40 in captivity. Adult size is reached around age 6 and sexual maturity at age 9. Females give birth to 1 -2 offspring every 2 years. 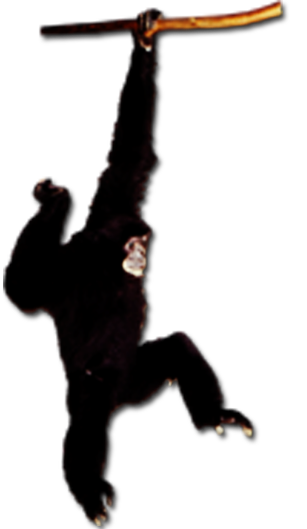 The anatomical design of Hylobates is well suited for life in the trees and for brachiation. According to Burnie and Wilson, “Brachiation is a method of locomotion utilizing arm swinging and hanging coupled with the use of the body as a pendulum. They release their grip with one hand at the highest point of the swing, while focusing on the next hand-hold, which may be 9 feet away. Hylobates have arms that are approximately 40 percent longer than their legs and a median wingspan of 5 feet. The size of the thumb is reduced and it is more proximally positioned which enhances gripping.” Each Hylobates species is recognized as endangered. Deforestation and hunting by humans is the main threat to their survival. H. lar can be found throughout Thailand, Malaysia, and Indonesia. This ape is extremely active during daylight hours, using the night to rest among the canopies. 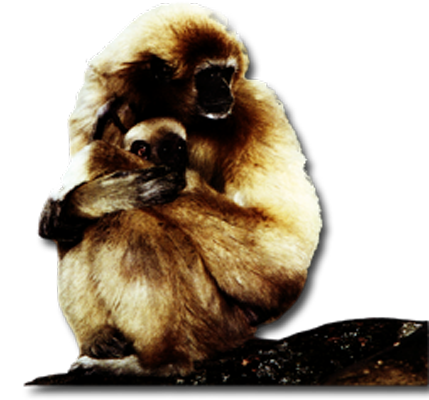 Like most gibbons this species forms pair bonds that typically last for life. Their day is begun with a pair bond duet consisting of the female loudly hooting to a climax with the male responding in more simple tones. These calls are used to reinforce their territorial claim and to possibly reinforce the pair bond. Their high metabolic output requires a diet fueled by fruits (which accounts for approximately 50 percent of their caloric intake), leaves, insects, and flowers. 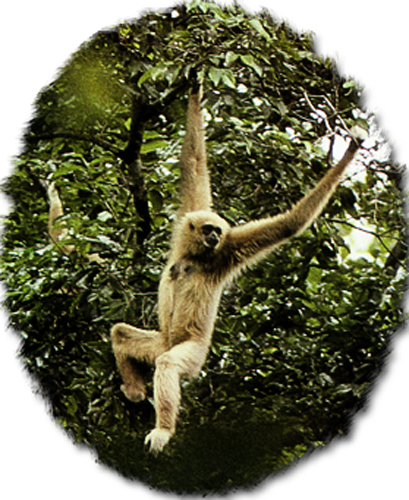 Unlike most gibbons this species has a crest of hair running along its crown. Offspring are born yellow with adult males becoming black and females brown or gray. 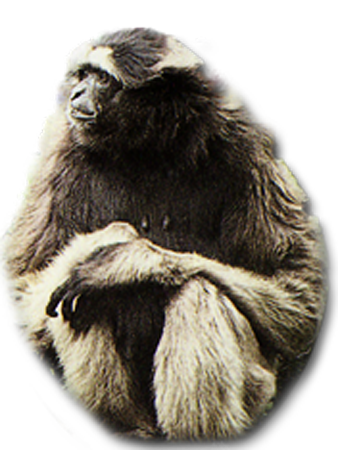 Until very recently this gibbon was considered a subspecies of the crested gibbon. They are distinguished by geography: The Crested Gibbon is found in northeast Vietnam while the White-cheeked gibbon is found in southwest Vietnam. Their silver hair is accented by their pale eyebrows, cheeks, and beards. The male and female of this species do not participate in duet calls. Unlike most species of Hylobates, the female siamang is the dominant member of the pair. The siamang is the largest of the lesser apes and can be found throughout Indonesia and Malaysia. 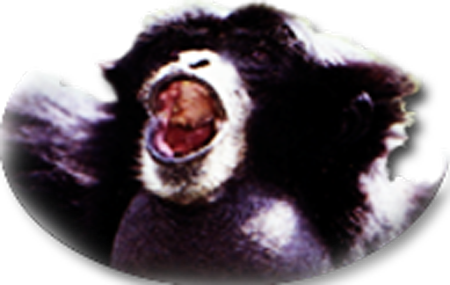 Siamangs are the loudest and most vocally complex of all the Hylobates. Each member of the pair uses their “elastic” throat sacs to resonate calls for means of defense and territorial claim. Siamang pairs spend a great deal of their day in very close proximity to one another. While either foraging, brachiating, resting, or eating, these apes are usually within 1 – 30 feet of each other. Their diet consists mainly of leaves, followed by fruits, blossoms, and grubs.